When it comes to fun ways to get fit, nothing beats the feeling of freedom we experience when bouncing on a trampoline. Whilst once upon a time the only access we had to trampolines was at a trampoline park or specialist gymnasium, nowadays there are many high-quality and affordable models on the market. This puts trampoline ownership within reach of anyone with a large enough backyard, and many families are now opting to purchase their own. After all, in this modern era many of us are looking for a fun way to get kids away from screens and taking part in physical exercise in the fresh air. Furthermore, many adults are recognising the fitness benefits that come with trampolining, and are interested in adding this fun activity into their exercise regimen. If you've been investigating the possibility of buying a trampoline for your own family, you may have come across the Sportspower brand. Sportpower manufacture and sell a range of trampolines, and you may be wondering if they are the right choice for you. We've been carrying out the research to find out whether these models represent a great purchase, so read on for our Sportspower trampoline review. How Does Sportspower Compare To Other Brands? 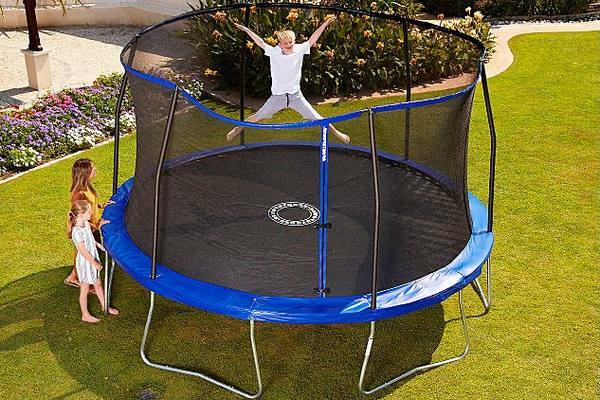 Small measurements: This trampoline has a diameter of just 84 inches. Low standing design: The bouncing surface is very close to the floor, so there is reduced risk of your child falling when climbing on or off their trampoline. Padded frame: The frame around the trampoline edge is padded with foam, so there is less risk of injury from falls or bumps. Durable: The trampoline is designed to be hard-wearing. This makes it ideal for outdoor use, although the small size also means that you could use it inside if you don't have a yard. 73.5 inch high safety net: This is a great integrated feature for safety, as it prevents your kids falling out due to an over-zealous bounce! Suitable for children aged 3+ years: This makes it an ideal choice if you have very young children for who a larger model may be unsafe. 100 lb weight limit: This product is designed for use by children exclusively, and the trade-off for the smaller size is a smaller weight limit. This means that it's really not an ideal choice if you want your trampoline to be suitable for every member of the family. Some reviewers on Amazon said that they were able to get in and bounce with their kids without any issues, but we don't recommend using any trampoline product for anything other than the intended use if you want it to last. Galvanised steel construction: This makes the product very durable. 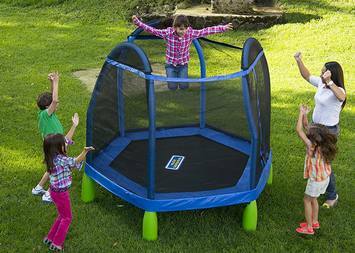 Safety enclosure: The safety enclosure is included with the price of the trampoline, and prevents nasty falls. This is an excellent feature if your children will be using the trampoline. UV resistant jump mat and enclosure: When a trampoline is left out in the sun for extended periods, the UV rays can gradually cause premature wearing. Luckily, both the enclosure and jump mat have been treated to prevent this, prolonging the life of your trampoline. U-shaped legs: This leg shape provides added stability, so there is less risk of the trampoline shifting during bouncing. This is a great safety feature and we are pleased to see it included in the Sportspower models! Padded frame: The frame around the edge of the jump mat is padded with soft foam, preventing injury if anyone falls while bouncing a little enthusiastically! Suitable for ages 6 and up: Therefore, if you are buying for very young children, this may not be the best choice for you. Galvanised steel frame: This is a highly durable material, which makes the trampoline hard-wearing and very suitable for outdoor use. Durable jump mat: This allows for smoother bouncing and prolongs the life of the trampoline. Easi-store safety enclosure: This makes the trampoline particularly safe for use by children, as it means they can bounce without the risk of falling from the trampoline. In addition, this can be easily removed and folded away when you're not using the trampoline, preventing it from becoming prematurely worn from being left outside all the time. Internal netting: Again, this adds an extra layer of safety to the trampoline. The netting prevents access to the springs and means that children cannot fall down the gap between the jump mat and the frame. Padded frame: Like the 15' model, foam padding provides extra protection against any nasty bumps or scrapes. Folding enclosure: This is extra convenient if you want to remove the enclosure between uses. Steel ladder: This allows easy and safe access to the trampoline, especially for children. Sportspower trampolines have been well-received by users and have some very good customer reviews. 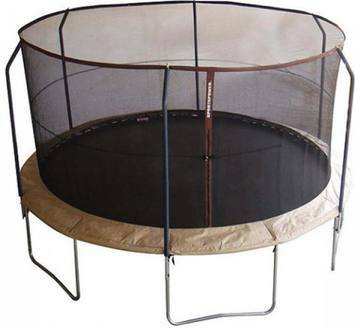 Users comment that the trampolines are of good quality and stand the test of time. Whilst some customers felt that the trampolines are towards the more expensive end, they feel that they are worth the financial outlay as they can withstand long-term use. Assembly is reported as being very easy, and generally customer satisfaction seems to be very high. In addition to online reviews, we looked carefully at the specs of the Sportspower models. They include various features that make the products high-quality. First of all, the galvanised steel that the products are made from is extremely durable, so the pipes of the frame are unlikely to bend during use. Also, the UV treatments of the jump mats and enclosures is a great addition that will prevent them perishing due to exposure to the sun. However, some expert reviewers have pointed out that the Velcro used to fasten the enclosures on Sportspower trampolines is not as safe as some other models on the markets, which use more secure zips. From the feedback and online expert reviews of the products, it seems that Sportpower are a trampoline brand that is well worth considering. Another high-profile brand that customers often consider is Skywalker. So, how do Sportspower trampolines measure up? When we compared similar products from both brands, we found them to be reasonably similar in terms of specifications. Both are highly durable and made from galvanised steel, and both brands have won excellent reviews from customers. However, some experts have pointed out that Sportpower trampolines are closer to the ground than Skywalker trampolines. This can be an advantage as it makes them easier to climb into, and in the unlikely event that someone were to fall from it, then being closer to the ground is definitely an advantage. On the other hand, Skywalker enclosures use a zip fastening whereas Sportspower uses Velcro. As it has been pointed out, a zip fastening provides a more secure closing as you can be sure that no-one can bounce out of the door! 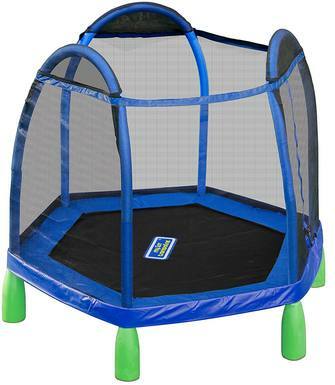 In terms of price, when we checked on Amazon Skywalker trampolines were retailing at a significantly lower price point. 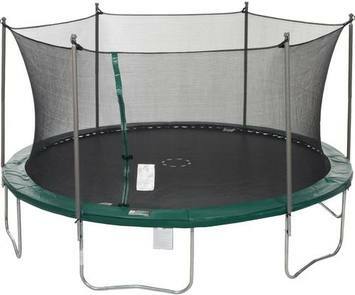 Therefore, if you're on a tight budget, a Skywalker trampoline may be a better option for you. According to their product specifications, when we compared Sportpower and Jump King products they sounded like they had very similar features. However, when we dug a little deeper, we found lots of reviews claiming that the Jump King had rusted in the rain. Additionally, there were complaints about poor customer service from Jump King. This is in contrast to Sportspower reviews, which are mainly very positive. Sportspower trampolines have a weight limit of 220 lbs, which is more than enough to accommodate most adults safely. The only exception is the My First Trampoline model, which is designed for use by children only and can support a maximum of 100 lbs. Replacement nets for all of the Sportpower trampoline sizes can be readily purchased from Amazon. We also found it easy to locate replacement parts including nets at online trampoline part stores on the internet. 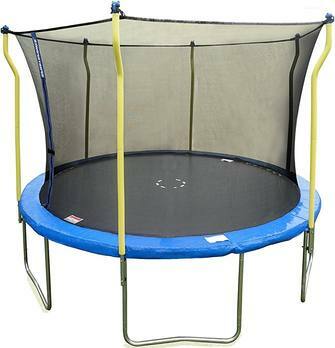 Durability: The galvanised steel and sturdy construction makes these trampolines long-lasting. If you're investing in a trampoline, you'll want to enjoy it for many years, so this is a big positive in our book! Range of products: We love the variety that Sportspower have to offer, as it gives plenty of choice depending on the space you have available. The small children's model is a nice addition to the range, and gives the younger members of our families an opportunity to enjoy the benefits of trampolining safely. Safety features: Overall, we were impressed with the range of safety features on Sportspower trampolines. It's fantastic that they all come with safety enclosures as standard. Also, including removable enclosures on some products is a fantastic idea, as it means you can expect your net to last for longer. The U-shaped legs on the large trampolines are also a nice feature, adding extra stability and safety. Overall, our view of the Sportspower trampoline brand is a positive one. However, we do believe that this brand would be improved with the inclusion of zip fastenings on their enclosures. At the moment they are using Velcro, which is of some concern as it is not as secure. As the enclosure is there to stop people bouncing off the trampoline, it is possible that the Velcro might not hold if someone bounced very hard against it. This should be taken into account when purchasing, and children should be made aware of the need to be careful not to bounce against the opening of the enclosure. Overall, we feel that the Sportspower brand is a good choice for families considering investing in a trampoline, whatever your needs or size requirements. The durability of the product means your purchase should provide your kids (and let's be honest, you as well) with many years of happy bouncing fun. Furthermore, the great safety features provide good peace of mind that you will be able to enjoy your bouncing time safely. However, as with all trampolines, it is important to check it regularly to ensure it is still in good condition. It is especially important to check that all the safety features are still in good working order and that there are no dangerous gaps or rough edges that could cause injury. Any damaged parts should be replaced before further use, and luckily these are easy to track down for Sportspower trampolines.